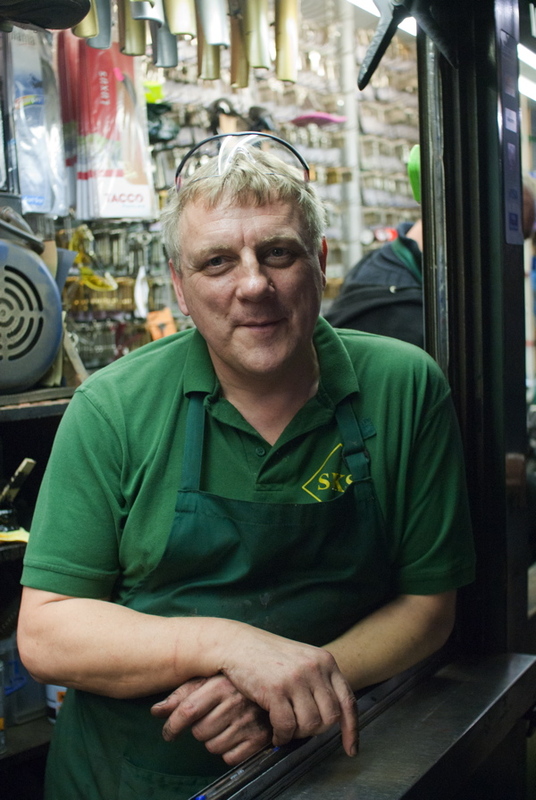 Twenty-two years ago, Gary built this narrow bar at the entrance to the Liverpool St Arcade where he and his colleague Mike Holding work fifty-four hours a week, mending shoes with all the flamboyant theatrics of cocktail waiters. They felt the blast of the Aldgate bomb here in 2005 and each winter they suffer the snow landing upon their backs, so every autumn they hang up a new tarpaulin to afford themselves some shelter from the future whims of fortune. 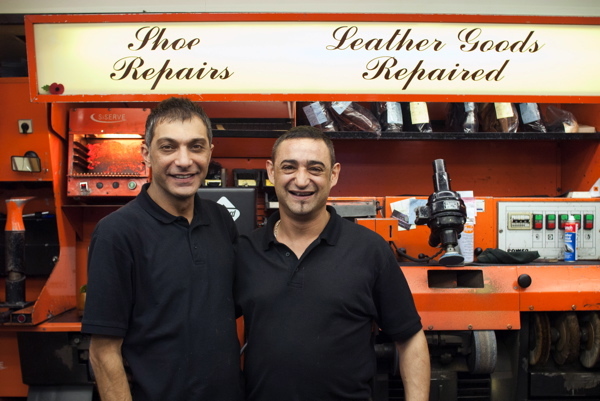 On the other side of Liverpool St Station, at the foot of the Broadgate Building, Kiri and George, the energetic double act at Michael’s Shoe Care, enjoy the privilege of having a door on their neat little shop, where everything is arranged with exquisite precision. 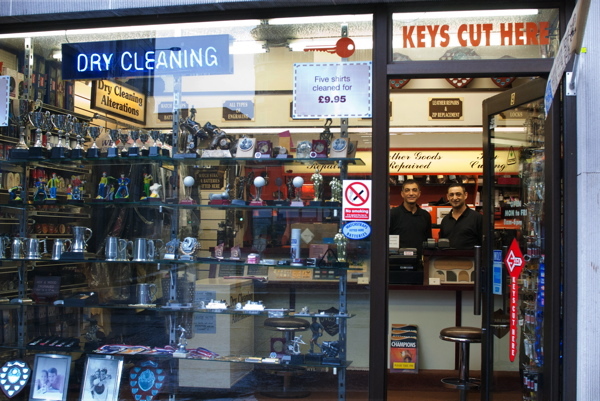 The additional service at Michael’s Shoe Care is the engraving of trophies, cups, plaques and statuettes which – as George explained to me enthusiastically – are in big demand as rewards by corporate customers focussed upon hitting targets and setting employees in competition against each other. George, who has been here more than twenty years, leaned across with eyes gleaming in anticipation and confided his hopes to me, “Many places closed down round here recently and thousands of people were moved out, but the new builds will bring a lot of extra office space to rent. It’s just a question of waiting and more people will come to us.” I glanced up at the gleaming monoliths and thought of all the engraved trophies that will be required to reward all the corporate striving within. Yet in spite of the pathos of this bizarre appropriation of sports day trophies, I was happy in the knowledge that Kiri & George will be secure in their jobs for years to come. I *love* getting my shoes repaired. God bless these artisans! Lovely looking chaps the lots of them – great photos. 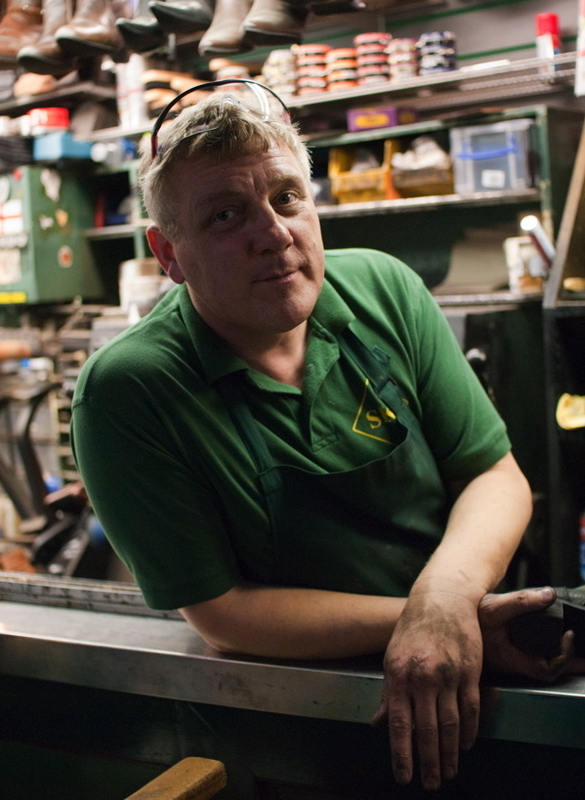 There used to be loads of cobblers in Eat London (excuse the double entendre) who were real craftsmen. 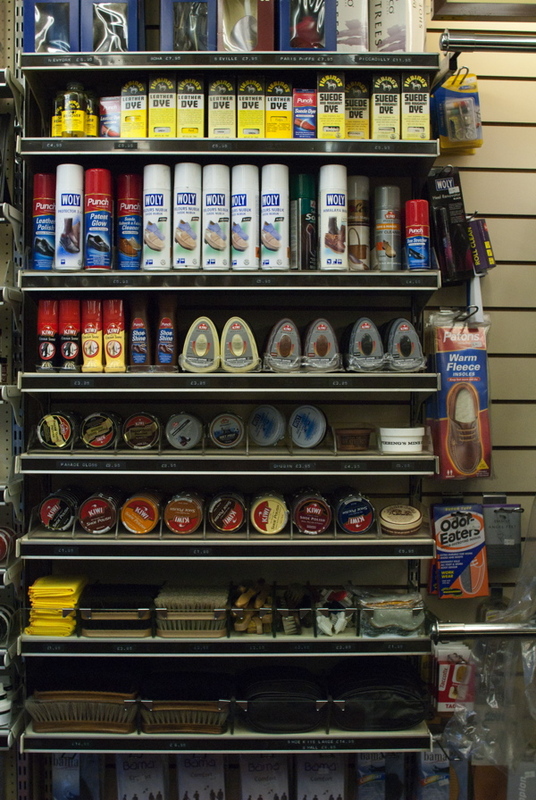 There was a very wonderful man who had a tiny shop in Limehouse, on the bend where West India Dock road met West Ferry Road. 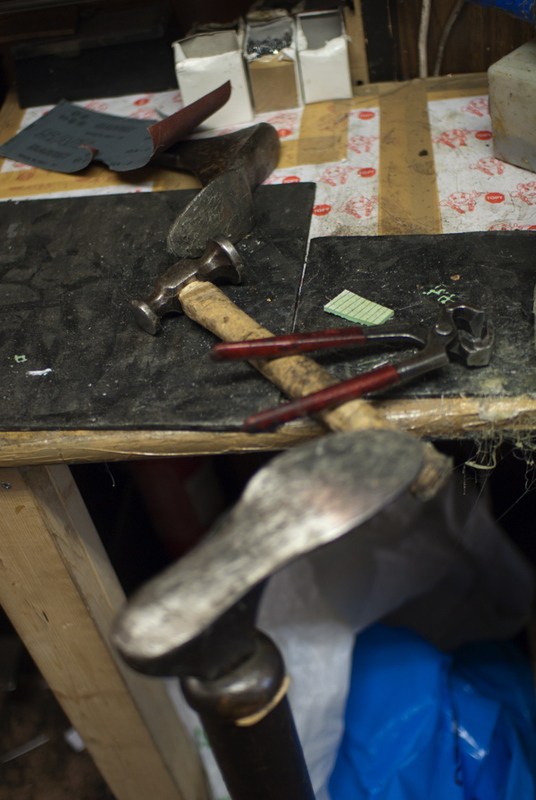 He was a real master of his trade and made shoes as well as repairing them. My Dad bought a pair of Oxfords from him that lasted decades. Beautiful leather. Sadly, like many artisans and craftsmen, the age of cheap disposable rubbish has seen their demise. 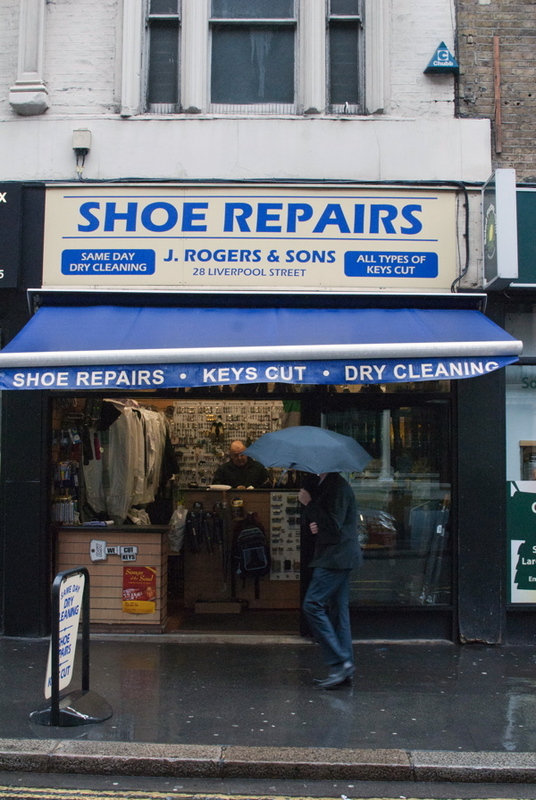 That’s Shoe Business (groan) in Leather Lane is my repairers of choice. 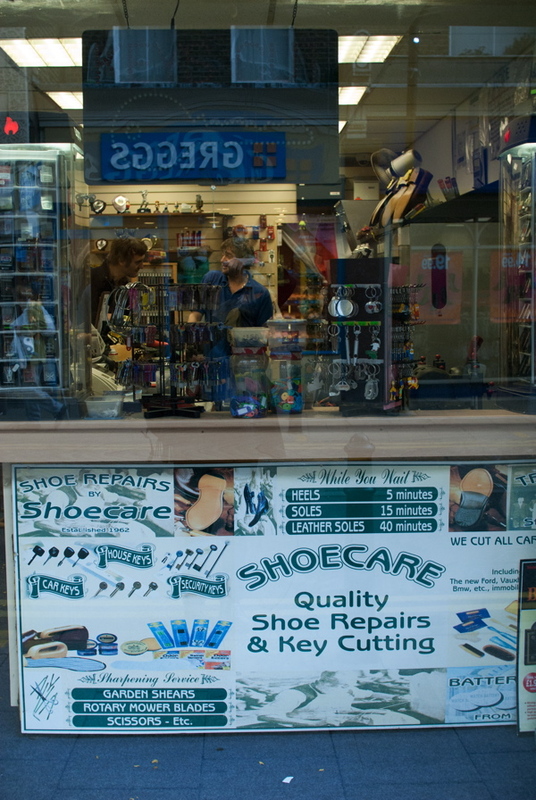 They can repair shoes that others would throw in the bin. 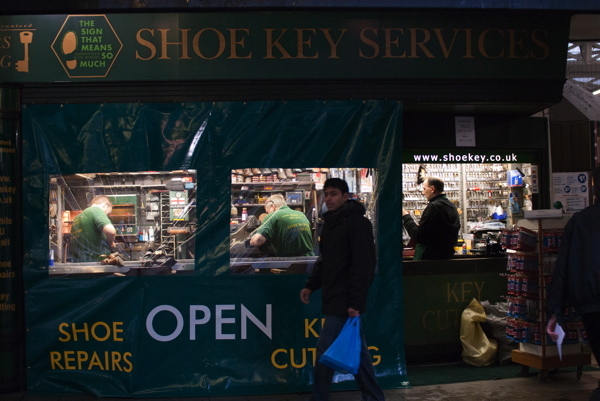 There’s nothing these blokes can’t do, and they’re cheaper than the Liverpool Street shoe bar. 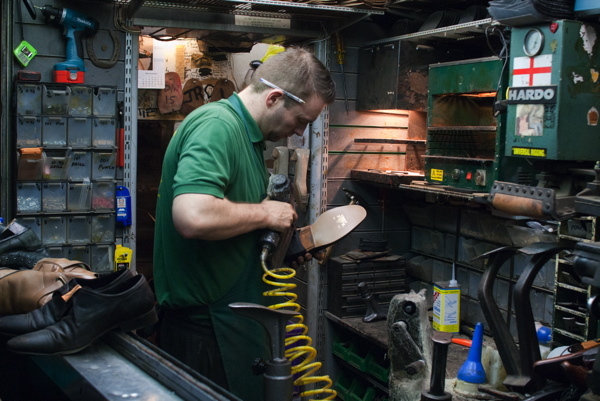 Also noteworthy is Hoxton Shoe Repairs in Hoxton Street. Thank you for this article. 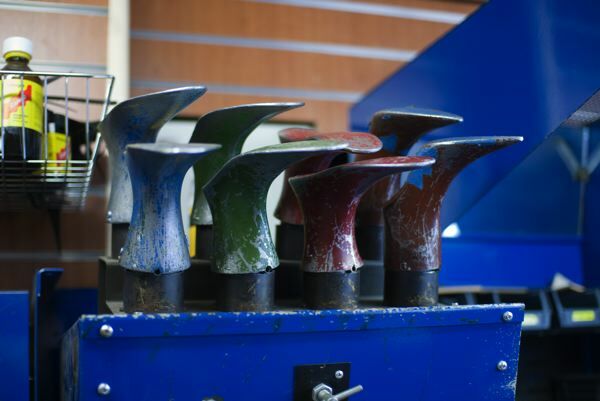 My great-grandfather was a boot-maker in 19th century Bromley. How I wish I had his shoe hammer. 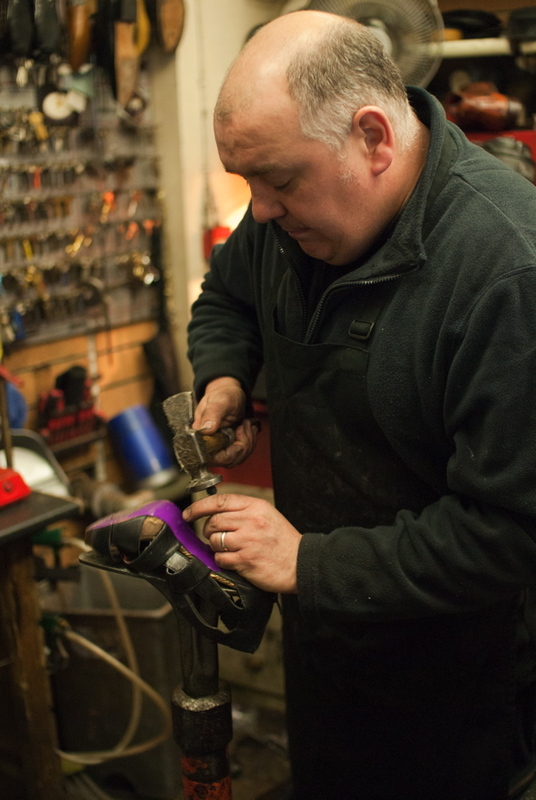 Amazing work these repairers do. In the 1880′s there was a considerable influx of Jews to the East End from Russia and Poland. Many of them were cobblers. My great-grandfather Jacob Freedman from Poland arrived in London about 1882. He was a slipper maker. He lived initially in a basement in the now extinct and unsavoury Dorset Steeet in Spilalfields, there my grandfather was born in 1886. 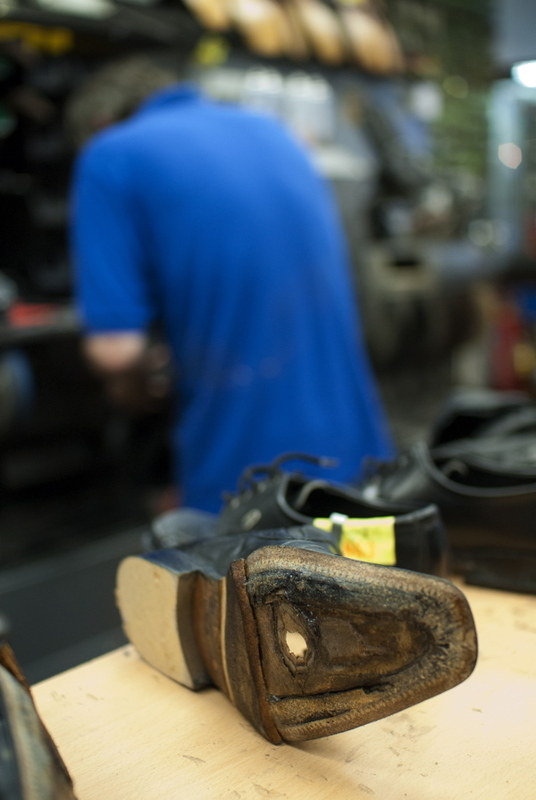 In the late 1880′s the shoe trade was becoming mechanised and many cobblers were out of work. So Jacob Freedman left his family in London and went to the USA where he lived in Brooklyn. Once established he sent for his family. But before they were able to join him they received a death certificate in December 1890. He had perished from the after affects of a fire in the Brooklyn tenament. So the family stayed in London where my father John Ronald Freedman was born in 1910. In 1921 the family emigrated to Australia. About 20 years ago I worked in a gallery at Bankside and used to have my shoes mended by a lovely guy who worked from a little unit at the side of a hairdressers along the way; I believe the hair salon was run by his daughter and her husband – it eventually became a Starbucks years after I left. In the 80s I lived at Hornchurch in Essex and some young guys on the High St would do ladies heels for the bargain price of a pound, their shop went like a fair all day! It’s nice to see cobblers are still able to earn a living. In my own home town in Scotland I think we are down to about 2 now, and a dry cleaning chain that sends them away for you. Thank you for capturing this trade with such insight & affection. Great pictures Sarah. Oh you can smell the glue just looking at the photos! 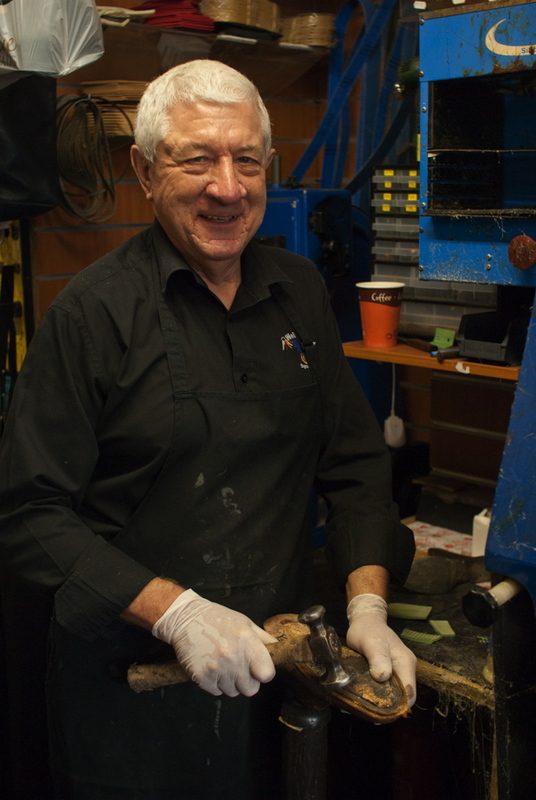 I always get a cheery bit of banter from all the shoe repair guys I’ve ever come across – and agree one hundred percent it’s so reassuring to know you’re getting another winter out of your favourite boots – the ones that know the shape of your feet and fit nice and snug around your aching feet! 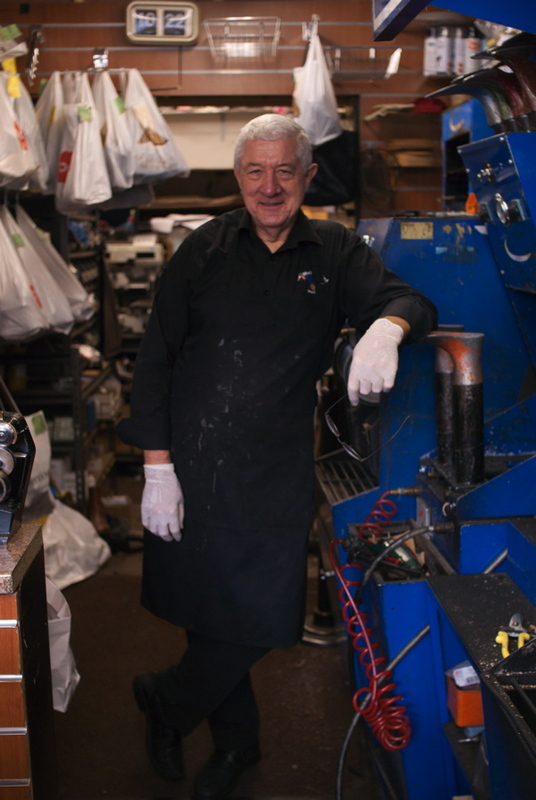 We had a great wee shoe repair hut near the station in Bishopbriggs Glasgow with paper bags of repaired shoes waiting for collection stacked up on the counter. I can remember my Mum’s friend telling her what a shock it was to discover that the Umbrella repair man couldn’t repair her collapsible umbrellas it was meant to be disposable!! What was the world coming to!